Believe it or not, I gained 30 pounds through the years, beginning when I lived in Scottsdale, Arizona in the early 2000s up until when I stepped on the scale here in my Vermont home on January 1, 2013. 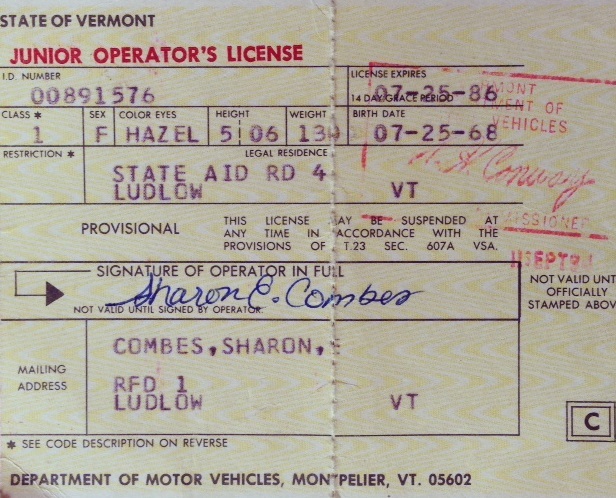 (Above: My driver’s license at age 16. I recall deducting 5 pounds from my actual weight when I filled in the form. Nearly 30 years later, I’m an inch taller and weigh the same). The first 10 pounds were the result of my thyroid slowing down, due to the radiation treatment I received in early 2002 to combat a hyper-thyroidal condition caused by Graves’ Disease. Although it is an interesting and somewhat scary story, I won’t bore you with the details of how it temporarily affected my life. What’s pertinent here is that, after enjoying most of my life below this weight, I didn’t get below 145 pounds again until earlier this year. The next 10 pounds were much more enjoyable to gain. I attribute them to a combination of my husband’s excellent cooking and my love of drinking wine along with all of that great food. I guess that, without the thyroid condition, I probably still would have gained at least 10 pounds through the second half of my ‘30s as a result of discovering the joys of great food and good wine. And, to be honest, I loved every minute of it! The last 10 pounds somehow got tacked on seasonally one winter, a few years after we moved back to Vermont, in 2007. I started putting on a few pounds at the tail end of each running season in the late fall, and continued adding them straight through the holidays, from a combination of going out to eat more, not resisting the plethora of holiday snacks in the office and at parties, and a seasonal curtailing of my commitment to exercise. As you might have guessed, weight gain during the holiday season is common, although studies about it vary. Most of these last 10 pounds I could lose pretty easily when I put in the effort, usually as a New Year’s Resolution. And I did so a few times. At one point in 2012, I had lost 15 pounds, only to gain it all back later in the year. Over the course of 2013, I lost 10 pounds early on, but ended up down seven pounds at year-end, mainly from a modest commitment to exercise and by not pigging-out over the holidays. That’s a condensed version of how I found myself weighing 158 pounds when New Year’s 2014 rolled around. Unless you’ve been living under a rock, you know that I decided to give up alcohol for the year and also to leverage this resolution to lose 20 additional pounds and to achieve my fastest marathon running time. In a blog post in late April, I announced that I had lost the 20 pounds and attributed my success to four things: (1) Quitting drinking, (2) Telling the world about it, (3) Approaching it like a marathon, and (4) Using an app to track everything. My marathon training schedule required me to step up my exercise regime beyond what I had done in the past. And I worked very, very hard on not “blowing it” during my training by over-compensating or over-rewarding myself; I described these strategies here. It paid off! During May, I lost 3 additional pounds. I simply cannot believe that I have now lost all 30 pounds that I had gained these last dozen years. My new challenge is to maintain my weight at 135 pounds. In fact, I am adding a new goal to the mix: Keeping the 30 pounds off over the next year, so that I can join the National Weight Control Registry. Sharon, your plan has worked really well. You looked stunning on Saturday night. I know what you mean about the before and after photos. Somewhere, I have a photo of me in a bikini when I started a diet a few years ago, when I weighed maybe 160 pounds. I am going to look for that. Maybe I’ll also get the nerve to take a new bikini shot this summer and do the before and after. I hated the before so much that I didn’t take my waist and hip measurements until after I had already lost 12 or so pounds! I agree that different things work for different people. In the end, it is whatever you do when you are at the point of being manaically focused on it, that you will succeed.